Given odds are one red will go in this round and the other will go in the final round, over half the average is a DEFINITE Deal for me here. That offer is 196% of the FD! £2,000 is still a good offer. Last edited by richie4eva1 on Tue Dec 13, 2016 5:51 pm, edited 1 time in total. 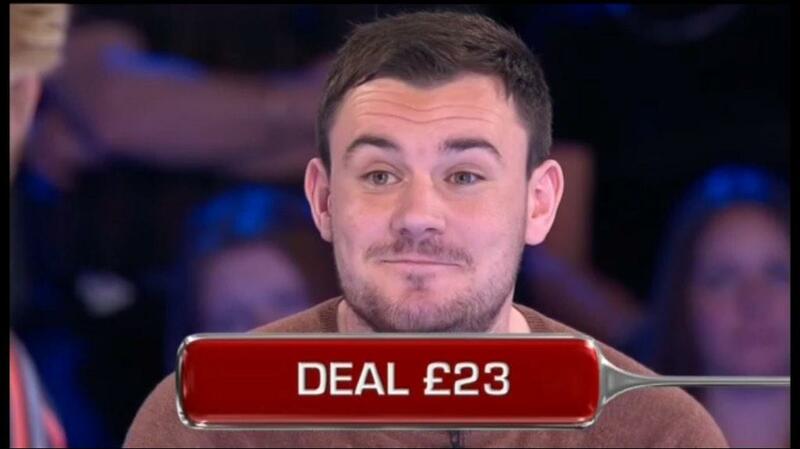 Given Jason's game yesterday, Karen could still have a shot at £20,000 if she Deals this. I am wrong yet again. £7,000+ would be a deal for me here but I'd have already gone at £5,000. Last edited by richie4eva1 on Tue Dec 13, 2016 5:59 pm, edited 1 time in total. Some VERY good offers today from 8 box onwards, though Karen certainly wasn't stupid going on at 8 and 5 box given the low stakes of the board. £8,000 on a blue/£20k finish is up there with late 2005/early 2007 generosity, and Karen was very wise to take it, regardless of her box contents. Good result from a mixed game. Hopefully she won't have too many regrets. A great game from the Eden Project, I went there when I was on holiday. I'm enjoying Deal or No Deal on Tour it's been great.